Climbers are plants that have a natural tendency to climb and some will even self-cling, without requiring tying-in to supports. Wall shrubs, by contrast, do not naturally climb. If left alone, they bush outwards and grow like shrubs. With specific pruning and training techniques, they can be trained to grow against walls. A climbing habit has evolved independently in several plant families, using many different climbing methods. Some plants climb by twining their stems around a support (e.g., morning glories, Ipomoea species). Others climb by way of adventitious, clinging roots (e.g., ivy, Hedera species), with twining petioles (e.g., Clematis species), or using tendrils, which can be specialized shoots (Vitaceae), leaves (Bignoniaceae), or even inflorescences (Passiflora). Others climb through the use of thorns, which pierce the support (e.g. climbing rose); or by other hooked structures, such as hooked branches. Species of Parthenocissus (Vitaceae) produce twining tendrils that are modified stems, but which also produce adhesive pads at the end that attach themselves quite strongly to the support. The evolution of a climbing habit has been implicated as a key innovation associated with the evolutionary success and diversification of a number of taxonomic groups of plants. Most climbers are flowering plants. 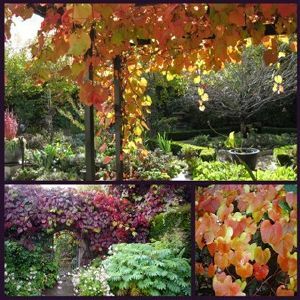 These may be divided into woody vines or lianas, such as wisteria, kiwifruit, and common ivy, and herbaceous (non woody) climbers, such as morning glory. 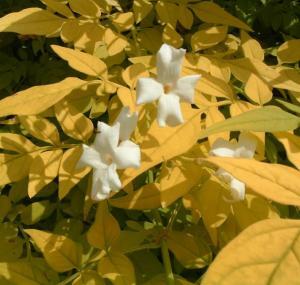 Jasminum officinale Fiona Sunrise, the Sunshine Jasmine flowers from May through to September with its heavenly scented white flowers. The yellow foliage starts in the spring with new growth tinged with red, summer brings the flowers and bright lush yellow foliage turning in autumn to the most glorious gold colour which lasts well into winter if mild weather permits. 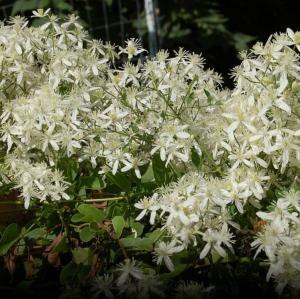 An excellent plant for growing on fences, arches and trellises. Grow in full sun or part shade in any good garden soil. Height and spread in 10 years 3m x 3m. 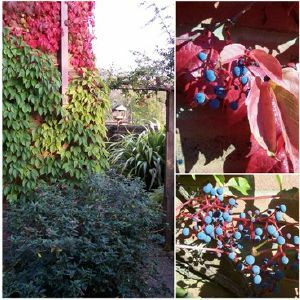 Parthenocissus himalayana var rubrifolia is a self clinging, moderate to vigorous, self supporting climber which will grow to 10m given suitable support. 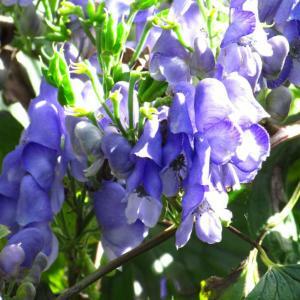 The very attractive reddish purple leaves turn a rich crimson in the autumn and the small fragrant flowers in summer are a haven for bees, and are followed by attractive bright blue berries. Parthenocissus himalayana rubrifolia needs full sun and a warm, sunny position. 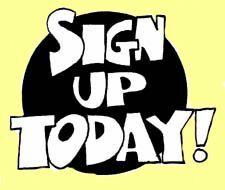 You can read my blog for further information. Vitis coignetiae ‘Claret Cloak' was found growing in a batch of seedlings of Vitis coignetiae during 1988 on our nurseries. Vitis ‘Claret Cloak' flowers during May and June and though largely inconspicuous they have a delicious scent which can be detected some distance from the plant. Fruit is borne abundantly in bunches in the autumn during favourable seasons. The adult leaves are olive green in colour and 15-20cm in diameter, three to five lobed with the apex pointed. They are quite thick and leathery. 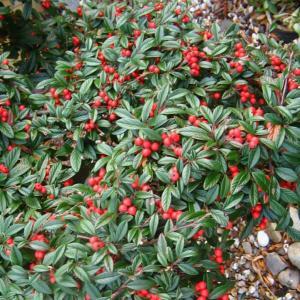 The shoots and young foliage are purplish red in colour and turn darker before ageing to green. The foliage turns rich scarlet in autumn.